This lease is designed for the lease of a manufacturing property back to the seller tenant operator following the sale of the property to an investor lender as part of a sale leaseback, which is essentially a financing transaction. The lease is a long term net lease oriented toward the lender investor's interests. It contains an extensive environmental section, as well as fair market value mechanics for determining rental for renewal options, extensive maintenance and repair language, a right of first refusal in favor of the tenant to purchase the property in the event the landlord wishes to accept a third party offer to purchase the leased premises during the term, and USA Patriot Act Certifications by the tenant. LEASE AGREEMENT, made as of ________________________, between SALE LEASEBACK LANDLORD, a ____________ limited liability company, or nominee, with an address ____________________________ (“ Landlord ”), and SALE LEASEBACK TENANT , a ____________ corporation, with an address __________________ (“ Tenant ”). “Acquisition Date” means the date on which Landlord has acquired all assets and interests in the property comprising the Leased Premises. “Additional Rent” has the meaning assigned to such term in Section 7. “Adjustment Date” has the meaning assigned to such term in Section 6. “Affiliate” of any Person means any Person (presently existing or hereafter created or acquired) controlling, controlled by or under common control with the specified Person, and “control” of a Person (including, with correlative meaning, the terms “controlled by” and “under common control with”) means the power to direct or cause the direction of the management, policies or affairs of the controlled Person, whether through ownership of securities or partnership or other ownership interests, directly or indirectly, by contract or otherwise. “Alterations” means all changes, additions, improvements or repairs to, all alterations, reconstructions, renewals, replacements or removals of and all substitutions or replacements for any of the Improvements or Building Equipment, both interior and exterior, structural and non-structural, and ordinary and extraordinary. “Appurtenances” means all tenements, hereditaments, easements, rights-of-way, rights, privileges in and to the Land, including (a) easements over other lands granted by any Easement Agreement and (b) any streets, ways, alleys, vaults, gores or strips of land adjoining the Land. “Assignment” means any assignment of rents and leases from Landlord to a Lender which (a) encumbers the Leased Premises and (b) secures Landlord's obligation to repay a Loan, as the same may be amended, supplemented or modified from time to time. “Building Equipment” has the meaning assigned to such term in Section 2. “Capital Growth Rate” means, at any given time, the yield to maturity of the “on the run” ten (10) year United States Treasury security plus four hundred (400) basis points. “Casualty” means any injury to or death of any person or any loss of or damage to the Leased Premises. “Commencement Date” means the date hereof. “Condemnation” means a Taking or a Requisition. “Condemnation Notice” means notice or knowledge of the institution of or intention to institute any proceeding for Condemnation. “Corporate Control Criteria” means, if deemed satisfied by any Transferee, that such Transferee has a Credit Rating of both “BB-” or higher from S&P and “B2” or higher from Moody's, in each case for the twenty-four (24) consecutive calendar month period prior to a Permitted Transfer and as of the date of the Permitted Transfer. “Corporate Control Event” means any of the following: (i) a merger or consolidation of Tenant or Guarantor with or into another Person; (ii) the sale of all or substantially all of the assets of Tenant or Guarantor to any Person; (iii) the acquisition by any one Person (including Affiliates of such Person) of fifty percent (50%) or more of the common stock, voting securities or economic benefits and burdens (including distributions) of Tenant or Guarantor within any twelve (12) month period; or (iv) a change in 50% or more of the Board of Directors of Tenant or Guarantor in any twelve (12) month period. “Costs” of a Person or associated with a specified transaction means all costs and expenses incurred by such Person or associated with such transaction, including reasonable attorneys' fees and expenses, expert fees and expenses, court costs, brokerage fees, escrow fees, title insurance premiums, mortgage commitment fees, mortgage points and recording fees and transfer taxes, as the circumstances require. For all purposes of this Lease, “attorneys' fees and expenses” and similar statements include those incurred out of court, at trial, on appeal or in any bankruptcy proceeding. “Default Rate” has the meaning assigned to such term in Section 7(a)(iii). “Easement Agreement” or “Easement Agreements” means any conditions, covenants, restrictions, easements, declarations, licenses and other agreements listed as Permitted Encumbrances or as may hereafter affect or benefit the Leased Premises. “Environmental Law” or “Environmental Laws” means (i) whenever enacted or promulgated, any applicable federal, state, foreign or local law, statute, ordinance, rule, regulation, license, permit, authorization, approval, consent, court order, judgment, decree, injunction, code, requirement or agreement with any governmental entity, (x) relating to pollution (or the cleanup thereof), or the protection of any Environmental Media, air, water vapor, surface water, groundwater, drinking water supply, land (including land surface or subsurface), plant, aquatic and animal life from injury caused by a Hazardous Substance or (y) concerning exposure to, or the use, containment, storage, recycling, reclamation, reuse, treatment, generation, discharge, transportation, processing, handling, labeling, production, disposal or remediation of Hazardous Substances, Hazardous Conditions, Hazardous Activities or Environmental Violations, in each case as amended and as now or hereafter in effect, and (ii) any common law or equitable doctrine (including injunctive relief and tort doctrines such as negligence, nuisance, trespass and strict liability) that may impose liability or obligations or injuries or damages due to or threatened as a result of the presence of, exposure to, or ingestion of, any Hazardous Substance. The term Environmental Law includes the federal Comprehensive Environmental Response Compensation and Liability Act of 1980 (“ CERCLA ”), the Superfund Amendments and Reauthorization Act, the federal Water Pollution Control Act, the federal Clean Air Act, the federal Clean Water Act, the federal Resources Conservation and Recovery Act of 1976 (including the Hazardous and Solid Waste Amendments to RCRA), the federal Solid Waste Disposal Act, the federal Toxic Substance Control Act, the federal Insecticide, Fungicide and Rodenticide Act, the federal Occupational Safety and Health Act of 1970, the federal National Environmental Policy Act and the federal Hazardous Materials Transportation Act, each as amended and as now or hereafter in effect and any similar state or local Law. “Environmental Media” means soil, fill material, or other geologic materials at all depths, groundwater at all depths, surface water including storm water and sewerage, indoor and outdoor air, and all living organisms, including all animals and plants, whether located on or off the Leased Premises. “Environmental Violation” means any one or more of the following, whether occurring prior to, on or after the date hereof: (a) any direct or indirect discharge, disposal, spillage, emission, escape, pumping, pouring, injection, leaching, Release, seepage, filtration or transporting of any Hazardous Substance at, upon, under, onto or within the Leased Premises or any Environmental Media, or from the Leased Premises to any Environmental Media, in violation of any Environmental Law or in excess of any reportable quantity established under any Environmental Law or which could result in any liability to Landlord, Tenant or Lender, any Federal, state or local government or any other Person for the costs of any removal or Remedial Actions or natural resources damage or for bodily injury or property damage, (b) any deposit, storage, dumping, placement or use of any Hazardous Substance at, upon, under or within the Leased Premises in violation of any Environmental Law or in excess of any reportable quantity established under any Environmental Law or which could result in any liability to any Federal, state or local government or to any other Person for the costs of any removal or Remedial Actions or natural resources damage or for bodily injury or property damage, (c) the abandonment or discarding at the Leased Premises of any barrels, containers or other receptacles containing any Hazardous Substances in violation of any Environmental Laws, (d) any activity, occurrence or condition in connection with the Leased Premises which could result in any liability, cost or expense to Landlord or Lender or any other owner or occupier of the Leased Premises, or which could result in a creation of a lien on the Leased Premises under any Environmental Law, or (e) any violation of or noncompliance with any Environmental Law in connection with the Leased Premises. “Event of Default” has the meaning assigned to such term in Section 22. “Existing Environmental Condition” has the meaning assigned to such term in Section 10(g). “Expansion” has the meaning assigned to such term in Section 13. “Expiration Date” means the Initial Expiration Date or, if this Lease has been extended for a Renewal Term in accordance with Section 5, the last day of such Renewal Term. “Fair Market Rental Value of the Leased Premises” means the rent that would be paid by a willing tenant and accepted by a willing landlord in an arm length's lease of the Leased Premises in which neither party is under any compulsion to lease, but without consideration of any concessions, allowances or other inducements then normally being offered to prospective tenants. Fair Market Rental Value of the Leased Premises shall be determined by the appraisal process set forth in Exhibit F .
“Full Rent Commencement Date” means the first day of the month following the month in which the Acquisition Date occurs. “GAAP” means generally accepted accounting principles. “Government Lists” has the meaning assigned to such term in Exhibit E.
“Guarantor” means ______________., a ____________ corporation. “Hazardous Activity” means any activity, process, procedure or undertaking which directly or indirectly (i) procures, generates or creates any Hazardous Substance; (ii) causes or results in (or threatens to cause or result in) the release, seepage, spill, leak, flow, discharge or emission of any Hazardous Substance into the environment (including the air, ground water, watercourses or water systems), (iii) involves the containment or storage of any Hazardous Substance; or (iv) would cause the Leased Premises or any portion thereof to become a hazardous waste treatment, recycling, reclamation, processing, storage or disposal facility within the meaning of any Environmental Law. “Hazardous Condition” means any condition resulting from an act or omission occurring after the date hereof which would support any claim or liability under any Environmental Law. “Hazardous Substance” or “Hazardous Substances” means (i) any substance, material, product, petroleum, petroleum product, derivative, compound or mixture, mineral (including asbestos), chemical, gas, medical waste, or other pollutant, in each case whether naturally occurring, man-made or the by-product of any process, that is toxic, harmful or hazardous or acutely hazardous to the environment or public health or safety, (ii) those materials included within the definitions of “hazardous substances,” “extremely hazardous substances,” “hazardous materials,” “toxic substances” “toxic pollutants,” “hazardous air pollutants” “toxic air contaminants,” “solid waste,” “hazardous waste,” “pollutants,” contaminants” or similar categories under any Environmental Laws, or (iii) any substance supporting a claim under any Environmental Law, whether or not defined as hazardous as such under any Environmental Law. Hazardous Substances include any toxic or hazardous waste, pollutant, contaminant, industrial waste, petroleum or petroleum-derived substances or waste, radon, radioactive materials, asbestos, asbestos containing materials, urea formaldehyde foam insulation, lead and polychlorinated biphenyls. “Impositions” has the meaning assigned to such term in Section 9. “Improvements” has the meaning assigned to such term in Section 2. “Indemnitee” has the meaning assigned to such term in Section 15. “Initial Appraiser” has the meaning assigned to such term in Exhibit F.
“Initial Expiration Date” has the meaning assigned to such term in Section 5. 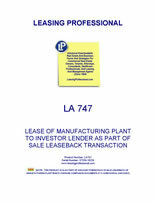 “Leased Premises” has the meaning assigned to such term in Section 2. “Initial Valuation” has the meaning assigned to such term in Exhibit F.
“Insurance Requirements” means the requirements of all insurance policies required to be maintained in accordance with this Lease. “Interim Rent” has the meaning assigned to such term in Section 6. “Land” has the meaning assigned to such term in Section 2. “Law” means any constitution, statute, rule of law, code, ordinance, order, judgment, decree, injunction, rule, regulation, policy, requirement or administrative or judicial determination, even if unforeseen or extraordinary, of every duly constituted governmental authority, court or agency, now or hereafter enacted or in effect. “Lease” means this Lease Agreement. “Lease Guaranty” has the meaning the Guaranty and Suretyship Agreement dated ______________ made by Guarantor to Landlord. “Lease Year” means (a) the period commencing on the Full Rent Commencement Date and ending at midnight on the last day of the twelfth (12th) consecutive calendar month thereafter, and (b) each succeeding twelve (12) month period occurring during the Term. “Legal Requirements” means the requirements of all present and future Laws (including Environmental Laws and Laws relating to accessibility to, usability by, and discrimination against, disabled individuals) and all covenants, restrictions and conditions now or hereafter of record which may be applicable to Tenant or to the Leased Premises, or to the use, manner of use, occupancy, possession, operation, maintenance, alteration, repair or restoration of the Leased Premises, even if compliance therewith necessitates structural changes or improvements or results in interference with the use or enjoyment of the Leased Premises. “Lender” means any person or entity (and their respective successors and assigns) which may, after or contemporaneously with the date hereof, make a Loan to Landlord or is the holder of any Note. “Loan” means any loan made by one or more Lenders to Landlord, which loan is secured by a Mortgage and an Assignment and is evidenced by a Note. “Minimum Rent” has the meaning assigned to such term in Section 6. “Minimum Rent Payment Date” has the meaning assigned to such term in Section 6. “Monetary Obligations” means Rent and all other sums payable by Tenant under this Lease to Landlord, to any third party on behalf of Landlord or to any Indemnitee. “Mortgage” means any mortgage or deed of trust from Landlord to a Lender which (a) encumbers the Leased Premises and (b) secures Landlord's obligation to repay a Loan, as the same may be amended, supplemented or modified. “Net Award” means (a) the entire award payable to Landlord or Lender by reason of a Condemnation whether pursuant to a judgment or by agreement or otherwise, or (b) the entire proceeds of any insurance required under clauses (i), (ii) (to the extent payable to Landlord or Lender), (iv), (v) or (vi) of Section 16(a), as the case may be, less any expenses incurred by Landlord and Lender in collecting such award or proceeds. “Note” means any promissory note evidencing Landlord's obligation to repay a Loan, as the same may be amended, supplemented or modified. “Owner” has the meaning assigned to such term in Exhibit E.
“Permitted Encumbrances” means those covenants, restrictions, reservations, liens, conditions and easements and other encumbrances of record as of the date hereof, other than any Mortgage or Assignment, and liens for unpaid real estate taxes and assessment not yet due and payable. “Permitted Transfer” has the meaning assigned to such term in Section 22. “Permitted Violations” has the meaning assigned to such term in Section 14. “Person” means an individual, partnership, association, corporation, trust or other legal entity. “Present Value” of any amount means such amount discounted by a rate per annum which is the lower of (a) the Prime Rate at the time such present value is determined or (b) eight percent (8%) per annum. “Primary Term” has the meaning assigned to such term in Section 5. “Prime Rate” means the annual interest rate as published, from time to time, in the Wall Street Journal as the “Prime Rate” in its column entitled “Money Rate”. The Prime Rate may not be the lowest rate of interest charged by any “large U.S. money center commercial banks” and Landlord makes no representations or warranties to that effect. In the event the Wall Street Journal ceases publication or ceases to publish the “Prime Rate” as described above, the Prime Rate shall be the average per annum discount rate (the “ Discount Rate ”) on ninety-one (91) day bills issued from time to time by the United States Treasury (“ Treasury Bills ”) at its most recent auction, plus three hundred (300) basis points. If no such 91-day Treasury Bills are then being issued, the Discount Rate shall be the discount rate on Treasury Bills then being issued for the period of time closest to ninety-one (91) days. “Purchase Agreement” means the Purchase Agreement dated as of _______________ between Tenant, as seller, and Landlord, as purchaser, relating to the Leased Premises. “Release” means any active or passive spilling, leaking, pumping, pouring, emitting, emptying, discharging, injecting, escaping, leaching, dumping or disposing of any Hazardous Substance into any Environmental Media. For the purposes of this Lease, “Release” also includes any threatened Release. “Remedial Actions” means any investigation, work plan preparation removal, repair, cleanup, abatement, remediation, monitored natural attenuation, natural resource damage assessment and restoration, closure, post-closure, detoxification or remedial activity of any kind whatsoever necessary to address any Release, any Environmental Violation and/or any Hazardous Condition. “Remediation Plan” has the meaning assigned to such term in Section 10. “Renewal Date” has the meaning assigned to such term in Section 5. “Renewal Term” has the meaning assigned to such term in Section 5. “Rent” means, collectively, Minimum Rent and Additional Rent. “Requesting Party” has the meaning assigned to such term in Section 25. “Requisition” means any temporary requisition or confiscation of the use or occupancy of the Leased Premises by any governmental authority, civil or military, whether pursuant to an agreement with such governmental authority in settlement of or under threat of any such requisition or confiscation, or otherwise. “Responding Party” has the meaning assigned to such term in Section 25. “Restoration Fund” has the meaning assigned to such term in Section 19. “Set-Off” has the meaning assigned to such term in Section 8. “Site Reviewers” has the meaning assigned to such term in Section 10(c). “Site Assessment” has the meaning assigned to such term in Section 10. “SNDA Provisions” has the meaning assigned to such term in Section 31. “State” means, with respect to the Land comprising the Leased Premises, the jurisdiction in which such parcel is located. “Subleases” has the meaning assigned to such term in Section 20. “Surviving Obligations” means any obligations of Tenant under this Lease, actual or contingent, which arise on or prior to the expiration or prior termination of this Lease or rejection in bankruptcy, which survive such expiration, termination or rejection by their own terms. “Taking” means (a) any taking of, or damage to, all or a portion of the Leased Premises (i) in or by condemnation or other eminent domain proceedings pursuant to any Law, general or special, or (ii) by reason of any agreement with any condemnor in settlement of or under threat of any such condemnation or other eminent domain proceeding, or (iii) by any other means, or (b) any de facto condemnation. The Taking shall be considered to have taken place as of the later of the date actual physical possession is taken by the condemnor, or the date on which the right to compensation and damages accrues under the law applicable to the Leased Premises. “Term” means the Primary Term or any Renewal Term, whichever is then in effect. “Third Appraiser” has the meaning assigned to such term in Exhibit F.
“Third Party Offer” has the meaning assigned to such term in Section 21. “Third Party Purchaser” has the meaning assigned to such term in Section 21. “Third Valuation” has the meaning assigned to such term in Exhibit F.
“Trade Fixtures” means all machinery, apparatus, furniture, fixtures and equipment now or hereafter installed by Tenant and used in connection with the conduct of Tenant's business on the Leased Property, other than fixtures and items of personal property that are integral to the ownership, maintenance and operation of the Improvements and which cannot be removed from the Leased Property without adversely affecting the value, or the general utility or use of such Leased Property. “Transferee” has the meaning assigned to such term in Section 22. “Use” has the meaning assigned to such term in Section 10. “Valuation Notice” has the meaning assigned to such term in Exhibit F.
“Valuation Period” has the meaning assigned to such term in Exhibit F.
“Work” has the meaning assigned to such term in Section 13. (c) the fixtures, machinery, equipment and other property described in Exhibit C hereto (collectively, the “ Building Equipment ”). 3. Title, Condition and Possession. (a) The Leased Premises are demised and let subject to (i) the rights of any Persons in possession of the Leased Premises, (ii) the existing state of title of the Leased Premises, including any Permitted Encumbrances, (iii) any state of facts which an accurate survey or physical inspection of the Leased Premises might show, (iv) all Legal Requirements, including any existing violation of any thereof, and (v) the condition of the Leased Premises as of the Commencement Date, without representation or warranty by Landlord. (b) LANDLORD LEASES AND WILL LEASE AND TENANT TAKES AND WILL TAKE THE LEASED PREMISES AS IS. TENANT ACKNOWLEDGES THAT LANDLORD (WHETHER ACTING AS LANDLORD HEREUNDER OR IN ANY OTHER CAPACITY) AND THE INDEMNITEES HAVE NOT MADE AND WILL NOT MAKE, NOR SHALL LANDLORD OR ANY OF THE INDEMNITEES BE DEEMED TO HAVE MADE, ANY WARRANTY OR REPRESENTATION, EXPRESS OR IMPLIED, WITH RESPECT TO THE LEASED PREMISES, INCLUDING ANY WARRANTY OR REPRESENTATION AS TO (i) ITS FITNESS, DESIGN OR CONDITION FOR ANY PARTICULAR USE OR PURPOSE, (ii) THE QUALITY OF THE MATERIAL OR WORKMANSHIP THEREIN, (iii) THE EXISTENCE OF ANY DEFECT, LATENT OR PATENT, (iv) LANDLORD'S TITLE THERETO, (v) VALUE, (vi) COMPLIANCE WITH SPECIFICATIONS, (vii) LOCATION, (viii) USE, (ix) CONDITION, (x) MERCHANTABILITY, (xi) QUALITY, (xii) DESCRIPTION, (xiii) DURABILITY, (xiv) OPERATION, INCOME, EXPENSES, ENTITLEMENTS OR ZONING, (xv) THE EXISTENCE OF ANY HAZARDOUS SUBSTANCE, ENVIRONMENTAL VIOLATION, RELEASE, HAZARDOUS CONDITION OR HAZARDOUS ACTIVITY OR (xvi) COMPLIANCE OF THE LEASED PREMISES WITH ANY LAW OR LEGAL REQUIREMENT; AND ALL RISKS INCIDENT THERETO ARE TO BE BORNE BY TENANT. TENANT ACKNOWLEDGES THAT THE LEASED PREMISES ARE OF ITS SELECTION AND TO ITS SPECIFICATIONS AND HAVE BEEN INSPECTED BY TENANT AND ARE SATISFACTORY TO IT. IN THE EVENT OF ANY DEFECT OR DEFICIENCY IN THE LEASED PREMISES OF ANY NATURE, WHETHER LATENT OR PATENT, NEITHER LANDLORD NOR ANY INDEMNITEES SHALL HAVE ANY RESPONSIBILITY OR LIABILITY WITH RESPECT THERETO OR FOR ANY INCIDENTAL OR CONSEQUENTIAL DAMAGES (INCLUDING STRICT LIABILITY IN TORT). THE PROVISIONS OF THIS SECTION 3(b) HAVE BEEN NEGOTIATED, AND ARE INTENDED TO BE A COMPLETE EXCLUSION AND NEGATION OF ANY WARRANTIES BY LANDLORD OR ANY INDEMNITEE, EXPRESS OR IMPLIED, WITH RESPECT TO THE LEASED PREMISES, ARISING PURSUANT TO THE UNIFORM COMMERCIAL CODE OR ANY OTHER LAW NOW OR HEREAFTER IN EFFECT OR ARISING OTHERWISE. (c) Tenant represents to Landlord that Tenant has examined the title to the Leased Premises prior to the execution and delivery of this Lease and has found the same to be satisfactory for the purposes contemplated hereby. Tenant acknowledges that fee simple title (both legal and equitable) is in Landlord and that Tenant has only the leasehold right of possession and use of the Leased Premises as provided herein. 4. Use of Leased Premises; Quiet Enjoyment. (a) Tenant may occupy and use the Leased Premises for the operation of any lawful business purpose related to the conduct of Tenant's business. Tenant shall not use or occupy or permit the Leased Premises to be used or occupied, nor do or permit anything to be done in or on the Leased Premises, in a manner which would or might (i) violate any Law, Legal Requirement or Easement Agreement, (ii) make void or voidable or cause any insurer to cancel any insurance required by this Lease, or make it difficult or impossible to obtain any such insurance at commercially reasonable rates, (iii) cause structural injury to any of the Improvements, (iv) constitute a public or private nuisance or waste, or (v) violate or not be permitted pursuant to, a Permitted Encumbrance. (b) Subject to the provisions hereof, so long as no Event of Default has occurred and is continuing, Tenant shall quietly hold, occupy and enjoy the Leased Premises throughout the Term, without any hindrance, ejection or molestation by Landlord with respect to matters that arise after the date hereof, provided that Landlord or its agents may enter upon and examine the Leased Premises at such reasonable times as Landlord may select and upon two (2) business days' prior notice to Tenant (except in the case of an emergency, in which no notice shall be required) for the purpose of inspecting the Leased Premises, verifying compliance or non-compliance by Tenant with its obligations hereunder and the existence or non-existence of an Event of Default or event which with the passage of time and/or giving of notice would constitute an Event of Default, showing the Leased Premises to prospective Lenders and purchasers and taking such other action with respect to the Leased Premises as is permitted by any provision hereof. (c) Tenant shall not abandon or vacate the Leased Premises and Tenant shall operate its business at the Leased Premises pursuant to the terms and provisions of this Lease. If Tenant ceases to do business at all or a material portion of the Leased Premises for a period longer than six (6) months, then Landlord may request that the Tenant use commercially reasonable efforts to attempt to sublet the Leased Premises. (a) Subject to the provisions hereof, Tenant shall have and hold the Leased Premises for an initial term (such term, as the same may be extended in the manner set forth hereinafter, being referred to herein as the “ Primary Term ”) commencing on the Commencement Date and ending on __________ (the “ Initial Expiration Date ”). If, on or prior to the Initial Expiration Date or the expiration of any Renewal Term this Lease shall not have been sooner terminated, then on the Initial Expiration Date and on the fifth, tenth, and fifteenth anniversaries of the Initial Expiration Date (the Initial Expiration Date and each such anniversary being referred to herein as a “ Renewal Date ”), Tenant shall have the right to extend the Term for an additional period of five years (each such extension period, a “ Renewal Term ”). In order to extend the then Term for a Renewal Term, Tenant shall notify Landlord at least twelve (12) months prior to, but no earlier than fifteen (15) months prior to, each Renewal Date that Tenant desires to extend the then Term for a Renewal Term. It is a condition to the extension of the Term of the Lease at each Renewal Date that (a) no Event of Default shall have occurred or be continuing as of the date Tenant gives notice to Landlord of Tenant's intention to so extend the Term for an additional five-year period, and (b) no Event of Default shall have occurred and be continuing as of such Renewal Date. Any such extension of the Term shall be subject to all of the provisions of this Lease, as the same may be amended, supplemented or modified (except that Tenant shall have no right to any additional renewal terms). (b) The Primary Term and/or any Renewal Term may also be extended upon the occurrence of certain events as set forth in Section 13(a). (c) During the last year of the Term (as the same may be renewed pursuant to Section 5(a)), Landlord shall have the right to advertise the availability of the Leased Premises for sale or reletting, to erect signs upon the Leased Premises indicating such availability and to show the Leased Premises to prospective tenants at such reasonable times as Landlord may select. Landlord shall also have the right at any time to show the Leased Premises to prospective purchasers or Lenders at such reasonable times as Landlord may select. 6. Minimum Rent; Interim Rent. Commencing on the Full Rent Commencement Date and continuing throughout the Primary Term, Tenant shall pay to Landlord, as annual minimum rent for the Leased Premises during the first Lease Year, the amount of __________________________________ and no/100 Dollars ($_________). The annual minimum rent for the second Lease Year and every Lease Year thereafter, beginning with the first day of the second Lease Year and continuing on the first day of third Lease Year and every Lease Year thereafter throughout the Primary Term (the first day of each such Lease Year being referred to herein as an “ Adjustment Date ”), shall be increased by an amount equal to _______ percent (____%) of the Minimum Rent payable immediately prior to the Adjustment Date. During any Renewal Term, such annual minimum rent shall be equal to ninety five percent (95%) of the Fair Market Rental Value of the Leased Premises. Such annual minimum rent, as so adjusted for any Lease Year during the Primary Term or any Renewal Term, is referred to herein as the “ Minimum Rent ”. Minimum Rent shall be subject to increases pursuant to Section 13(a). Minimum Rent shall be paid monthly in advance on the first day of each month during the Primary Term or any Renewal Term (each such day being a “ Minimum Rent Payment Date ”) in the amount of the annual Minimum Rent then in effect divided by twelve (12). Monthly Minimum Rent for the first Lease Year shall be ___________________ Dollars ($________) per month. Each such rental payment shall be made, at Landlord's sole discretion, to Landlord at its address set forth above or to such one or more other Persons, at such addresses and in such proportions as Landlord may direct by ten (10) days' prior written notice to Tenant (in which event Tenant shall give Landlord notice of each such payment concurrent with the making thereof). If required by Landlord, Tenant shall pay the Minimum Rent to Landlord (or to a Lender designated by Landlord) monthly by ACH and in immediately available funds. If you purchase this product, you are entitled to receive via email at no charge LA125 Lease Exhibit Sample Pack (113 single spaced pages). To receive LA125, you must email us after you purchase the LA described on this page to request it, and LA125 will be emailed to you promptly. Do not include LA125 in your shopping cart order. For more information and a complete list of exhibits included in LA125, click here.